Steve Homan, better known by his producer name STATX (pronounced Stat-icks), is an independent electronic and hip hop music producer. The pseudonym “STATX” is a combination of “ST” from Steve and “ATX”, which is an abbreviation for Austin, Texas, where he currently resides. 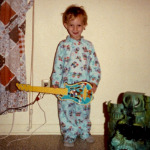 Steve was encouraged to play music at an early age. His mother would take him to various shows and music festivals in Austin, which had a big impact on his early musical taste. He started playing percussion for the school band in the 6th grade and pieced his first drum set together throughout his junior high years. He continued playing percussion for the school band into high school and was a drummer in several garage rock bands from middle school on into his 20’s. After his high school years, he developed an interest in audio recording and production, which eventually led him to found his own label, Statx Entertainment, as an outlet for all of the solo “beat music” that he had been recording on the side. In addition to working on his future releases and performing live, he also licenses music and runs a monthly producer showcase called Imaginary Stereo.